Tell us a bit about Orlando and Ivy and the concept behind it. 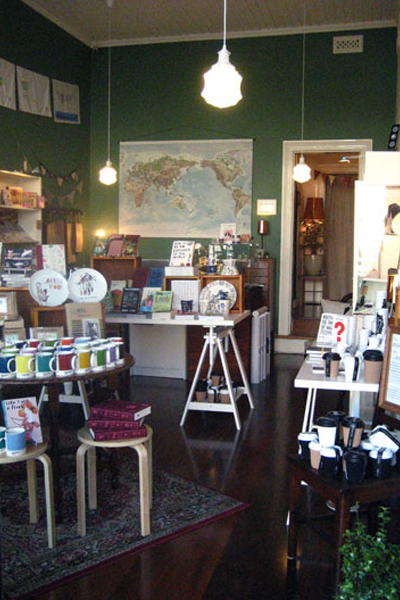 Orlando and Ivy is a creative haven and ideas hub masquerading as a totally unique and very spunky gift shop. I wanted to create a space where people weren’t necessarily shopping, but feeding their brain and their senses, and loading up on inspiration. I am a big believer in the creative spirit being alive and kicking inside every one of us, and it was really my intention to coax that out in an utterly delightful way. Exposing people to beautiful things, new ideas, innovative and sustainable design, and locally made work is really important to me: it’s about encouraging both genius, and a genuine attention to detail. I also wanted to build a bit of a haven for creative, aware and ideas-y people. In this hectic world where so much is disposable, quick and dirty, and fairly slim on ethics, it’s so easy to go about mindlessly consuming everything from takeaway coffee cups to mainstream media. Orlando and Ivy celebrates the people who want to put a little more thought into their day to day, and nurtures their effort to do so. Because I truly believe that in this day and age, making those kinds of authentic choices, and going against the tide is nothing short of an act of heroism. I like to think that we give those brilliant heroes beautiful and inspiring tools to go about fulfilling that quiet revolution. 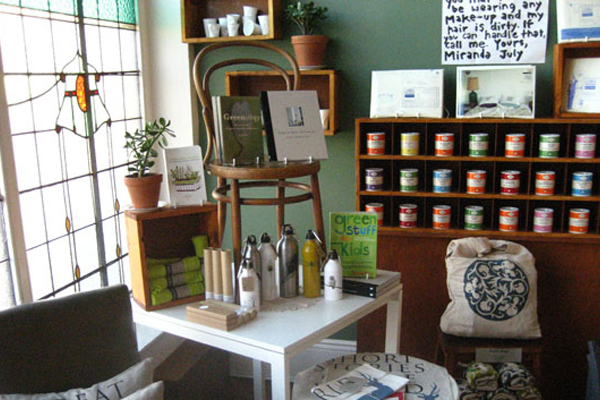 Orlando and Ivy, the North Melbourne shop, is also a space that feels terribly tranquil and yet wonderfully invigorating at the same time. In short: It’s about making amazing people feel amazing. We opened in March 2010, so we’re still relatively quite new! I launched our online store about two months later, so that non-Melbourne people could enjoy the benefits of O&I’s spoils, as well. My background is in performing arts – prior to opening Orlando and Ivy I was working as an actor, a director, writer, etc. By the end of 2009 I was feeling burnt out from years of chaotic freelance work, and was growing increasingly dissatisfied with being an actor for hire, whilst being poor as a church mouse when I did make the theatre that really stirred my soul. I knew that in order to retain my sense of wonder in my arts practice that I needed to do something radically different – and one that also really, strongly exercised my latent business muscle. I wanted to create a place where people could come to experience the wonder and pure inspiration that I had found as a child, growing up in Hobart, when I was exposed to new art forms, poets, musicians. I knew that in order to re-calibrate my sense of artistic vitality, I had to go back and rediscover what that innocent awakening to creativity was again – that belief in beauty and curiosity and all of its attendant potential. A gorgeous little inner-city hub seemed like the perfect vehicle for me to begin giving that incredible experience back out into the world, while simultaneously re-living it for myself. 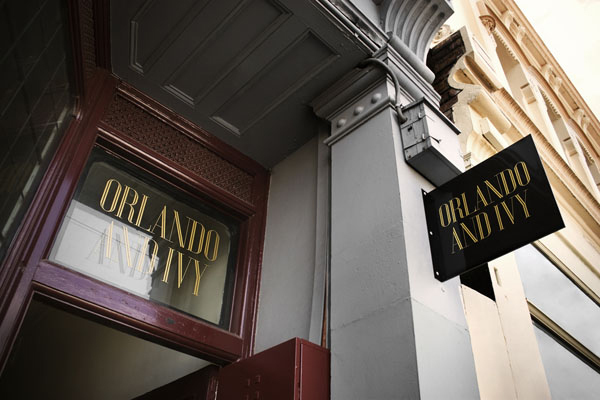 The primary criteria of pieces in the fascinatingly broad range at Orlando and Ivy, is either that they’re ethically and sustainably sourced or made, their design is out-of-this-world amazing, or that they’re clever, inspiring, ideas-and-creative-thought-provoking. Preferably (and mostly) all of the above. We stock books from authors such as Keri Smith, Anne Lamott, Miranda July, Pia-Jane Bijkerk, Edward de Bono, Paul Arden, and the inimitable Strunk & White; books on Banksy and Frank Lloyd Wright, Paris, Melbourne, Italy, and a lovely range of coffee-table art books. We also carry a few gorgeous, quality editions of childrens’ classics (such as Alice in Wonderland, Winnie the Pooh, Peter Rabbit, and old-school fairy tales). 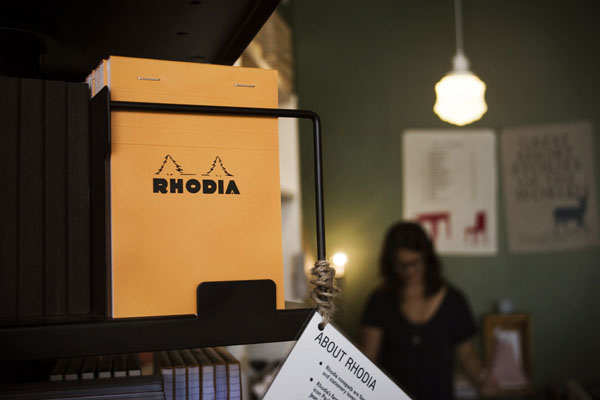 Stationary-wise we have cards from TMOD, Lisa Madigan and Vince; journals from Found n Bound, Rhodia, Clairefontaine, and Moleskine. 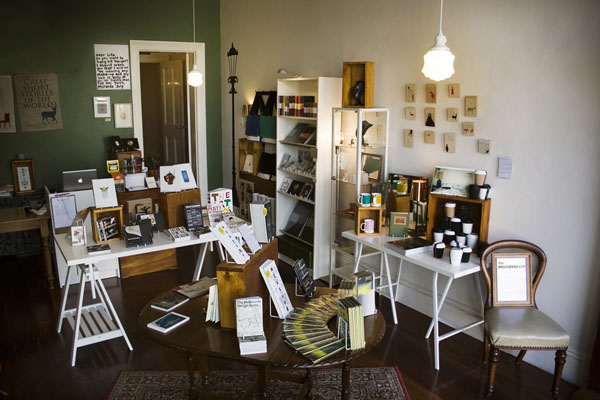 The Foundry’s great Measure and Tangent ranges; Lamy pens; prints and books by Ghost Patrol; decal artwork by Melbourne’s Shadow Theatre. Pantone bags & mugs, Penguin mugs & pencils, BYO Coffee Cups, Rob Brandt Crumple Cups, Taika: a range of Scandinavian Fox and Owl-themed tableware, Chimney House Shoes, Earth Lust Water Bottles. 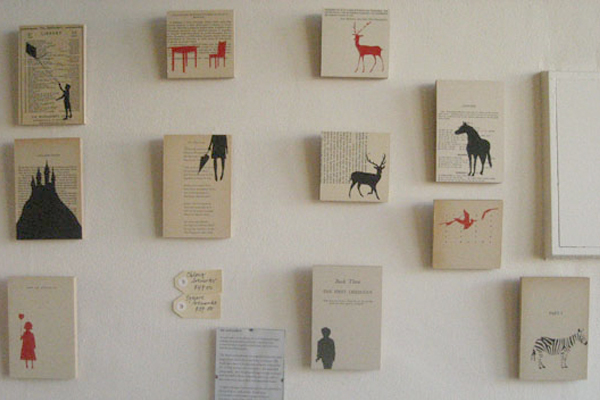 Dumbo Feather, Pass it On; Peppermint and SOHI magazines. Lots and lots of simply amazing work from Third Drawer Down; Cufflinks by Irwin Rohl, wearable art from Shabana Jacobson, Polli, Cat Rabbit, Lost in the Woods, Shonah and Gretchen Hillhouse. And other great locally and ethically made things like Greensacks, Earth Bags, fabric-y things by Ink and Spindle, tea-light lampshades from m2matiz, Dynomighty’s amazing microfibre Mighty Wallets, a whole range of goodness from Me and Amber, and the earth-shatteringly handsome Telegram World Map. To name a few. Meeting phenomenal people, and seeing them walk away inspired. I’ve met some mind-blowingly fascinating and ridiculously talented individuals through this shop – customers, suppliers, other shop owners, bloggers… the list goes on. These people definitely make my day worth it, and it thrills me no end when they’re in turn moved by Orlando and Ivy, or something they’ve found here. It’s a win-win situation! My husband, Nick and I have a little theatre company called The Melbourne Town Players. Our theatre-y work is on hold at the moment while I work on helping Orlando and Ivy to grow, but when we do make new work we are always playing (lovingly) with manipulating the form of traditional performance (I have a penchant for putting performance in domestic spaces, for example), and we are also strong advocates of a greater culturally and linguistically diverse representation in the performing arts, and gender equity across the sector. We are also currently writing and designing creativity courses that we will be rolling out in spring through Orlando and Ivy – the first being an in-depth guide to building a balanced, productive, and individual creative process into daily life. As artists, we know how easy it is to get off-kilter, off-track and all-consumed by both art and life. We are showing people how a really delicious and very healthy balance can be struck, so that both professional and aspiring arty types can be happy, functional, and artistically productive! The courses are going to be held both online, and in-person, so that Melbournites can get some good, old-fashioned face-to-face workshop goodness, and alternatively people from all over the globe can take part in their own homes, online. The other thing is that we’ve also just bought a gorgeous little, sustainably designed house in Daylesford, which we’re currently transforming into an eco-sustainable holiday retreat with many of the same design values (and work from designers) that you’ll find at Orlando and Ivy. We’re launching that in December, but prior to that, we’re going to be filming a lot of video content for the online leg of the creative process courses up there. So yes – when I’m not working at Orlando and Ivy, I’m… working on my other two businesses and my own arts practice. I like to keep myself busy! Learning how to budget both time and money has been something of a challenge for me. While I’m great at ideas, and even not too bad at strategy, I really have to force myself to confront the often terrifying task of designing operational systems. I know from experience (mine and other people’s) that once solid, and functional systems are there, it allows lovely places like this to soar, so I’m getting better at facing the music, knuckling down and using spreadsheets. But my strengths and passions are definitely in other areas: I love serving customers, finding new and beautiful ranges to stock, re-merchandising the shop, dreaming about Orlando and Ivy like a growing tree, and exploring the wonderful, complicated, beast that is the creative spirit. 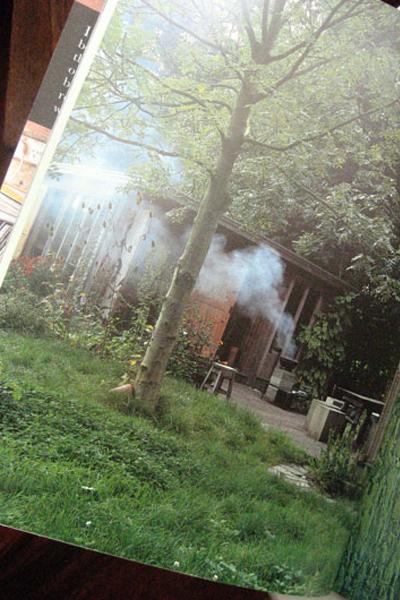 What a beautiful looking space, and I love Ming-Zhu’s ethos. Inspiring. That is such a gorgeous space. Love it!